We’re now well into 2016, which means it’s time for the year’s second edition of Pro Mobile. 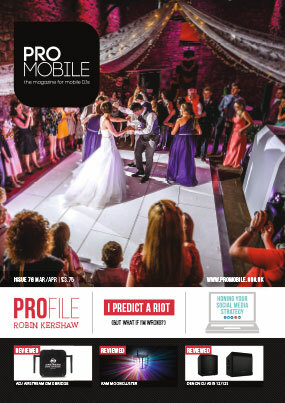 This issue we’ve got a great mix of articles and features covering every aspect of being a mobile DJ. Covering the music angle, Greg Cartwright explains why pigeonholing guests and predicting the tastes of an audience can be a dangerous game in his article I Predict A Riot. Meanwhile the performance aspect is covered by Mark Walsh who shares stories of disasters that could have ruined the gig but that were turned out to be stand-out moments. Finally, David Reed has the business side of things covered as he shares One Simple Change That Could Double Your DJ Business. There’s also a great collection of reviews including ADJ’s innovative Airstream DMX Bridge and Denon DJ’s much-anticipated AXIS range of coaxial active speakers. The head honcho of leading northern mobile DJ company Dancefloor Couture shares his journey from bar DJ to wedding host to multi-op manager. From Serious Mistake To Stand-Out Moment! Mark Walsh explores the pitfalls of poor preparation and the potential silver lining of make-or-break moments, as he explains why serious mistakes don’t have to mean the end of the world. A top 10 list of the best tracks from the rock 'n' roll era as voted for by Pro Mobile readers. Tony Winyard asks: is it time for a mind-set shift when you think of wedding bookings? Sara Walker explains in detail how social media can work wonders for your DJ business by putting in place a specific plan & then measuring the results. Dave Reed explains why it may be time for you to change the conversations you're having with prospective customers. In the final part of this series of articles, 'Ian D' Smith draws useful lessons from his experiences as a dance producer and remixer in the '90s. More musings and anecdotes from veteran mobile DJ Richard Linton in his regular article. David Reed, Greg Cartwright, Ian Forest, Ian Smith, Mark Walsh, Richard Linton, Robin Kershaw, Sara Walker and Tony Winyard.